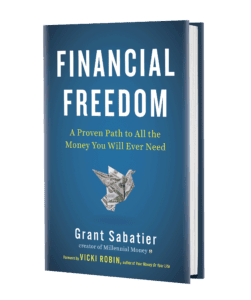 MM note: My book Financial Freedom: A Proven Path to All the Money You Will Ever Need with a foreword by Vicki Robin, is now available for preorder with a ton of bonuses here. Between 2010-2015, during what I now call “those five insane years,” I spent all of my time trying to make as much money as possible. I consistently worked 50+ hour weeks making money in my full-time digital marketing job and then another 30+ hours a week I was side hustling and at one point had a rotation of 13 different side hustles. In fact I attribute a lot of my own success directly to the investment gains I generated from side hustling. It would have taken me at least 5 more years to become financially independent without side hustling to investing. I was investing and saving up to 80% of my income some months. I drove an $800 car and lived in the crappiest apartment you could imagine, all while making six figures and investing as much as I could. Many of my friends who were climbing the career ladder bought nice new Audi and BMW SUVs and bought expensive condos near the lake with $4,000 a month mortgages. While I spent as little as possible and banked as much money as I could. What to many people would be viewed as a sacrifice, I viewed as an opportunity. An opportunity to get out. To escape forty years of wage slavery and cubicle life. To escape staying up all night worrying about money and worrying if I had enough. I wanted to escape the grind really bad. I wanted one thing: financial freedom. I knew the fastest way to get there was to invest as much money as early and often as I could. There is nothing more valuable to fast track financial freedom than making more money and compounding. So I put my head down and worked and worked and worked to make it happen. And because of a solid strategy, consistent execution, and some good old-fashioned luck, it happened. It took me 5 years and 3 months to go from $2.26 in my bank account to $1.25 million. Here’s more on how to save a million dollars. I’d reached my goal of becoming a millionaire and financially independent by 30, in what turned out to be the hardest thing I’ve ever done in my life. And of course, I also got lucky since I started investing in 2010 and the stock market absolutely crushed it between 2010-2015. But it wouldn’t have mattered if I wasn’t ready for it or I wasn’t investing as much money as I could. Without luck I would have gotten to FI, it just would have taken me a little a little longer. You can rely on luck, but you can increase your odds of getting lucky. Control what you can: your income, your savings rate, and your asset allocation and let compounding and time take care of the rest. While what I thought I wanted was money, as it turned out what I really wanted was time and space. Time and space to explore the world. Time to breath. Time to go deeper into myself and explore what it means to be alive. Time and space to grow. I wanted complete financial freedom, which to me means having freedom through money. When you have enough money, you have complete control over your space and time. Money is infinite – you can always go out and make more. But you can’t get more time. 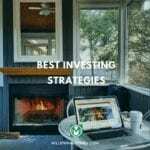 When you follow a great investing strategy, whether you are house hacking and investing in real estate, or investing in the stock market, when you make the most of your money you are making the most of your time. The more optimized and efficient you are with money, the more time you can buy and the less time you’ll need to spend working for money. Life is too short to not try and “retire” early and what I mean by “retire” is simply spending your time doing something you want, instead of something you need to do. While you should define what early retirement means to you, to me it’s not about money, it’s about how I spend my time. Since I don’t have to worry about money I can do what I want, so even though I’m still make money blogging, I’m retired because I don’t have to do it. I just enjoy it. There is no way that I could have written Financial Freedom if I hadn’t “retired” early from the corporate world and took back control of my time. In 2015 shortly after becoming financially independent I launched Millennial Money to write about my path to financial freedom. Writing about money and personal finance is a deep passion of mine, because it combines a few things I enjoy: writing, philosophy, and of course money. More and more people started showing up to the blog from all over the world and asking for help. I’ve received thousands of emails from Millennial Money readers and podcast listeners who share the intimate details of their money (and in many cases) personal lives. Money and life are so interconnected that it’s hard to talk about one without the other. Something I could have never imagined started happening. As it turned out I really enjoyed teaching and helping others. In fact, every reader or listener email I received meant more to me than any dollar I had made. I was blown away. If you would have told me 7 years ago that I would be a person with a mission I would have laughed at the impossibility. But it happened. I had actually found what I believe is my true purpose, my mission. My mission is to help relieve financial struggles in as many people’s lives as I can. Money stress is real. It impacts every area of our lives. It’s the number two reason for divorce, one of the top reasons for suicide, and consistently ranks as the top stressor in people’s lives. I know what it feels like to have nothing, and comparatively I’ve had, and have, so much more than most. I realized that I could only share so much in a blog post of video, and that in order to reach more people I would need to write a book. And write a book that wasn’t just the run of the mill here’s how you get your money life in order, but a book about life and money and time. A book that would help anyone, literally anyone, no matter where they are in their financial life to make more money and gain freedom through it. Most personal finance books take a one-dimensional perspective – they focus on how to save more money and make the most of what you have, but rarely focus on how to make more. Saving and making money are two sides of the same coin and making more money is the fastest way to reach financial freedom. Financial freedom is unique to you. Live your own life. I wrote the book Financial Freedom to help you reach the next level of financial freedom no matter where you are starting from. 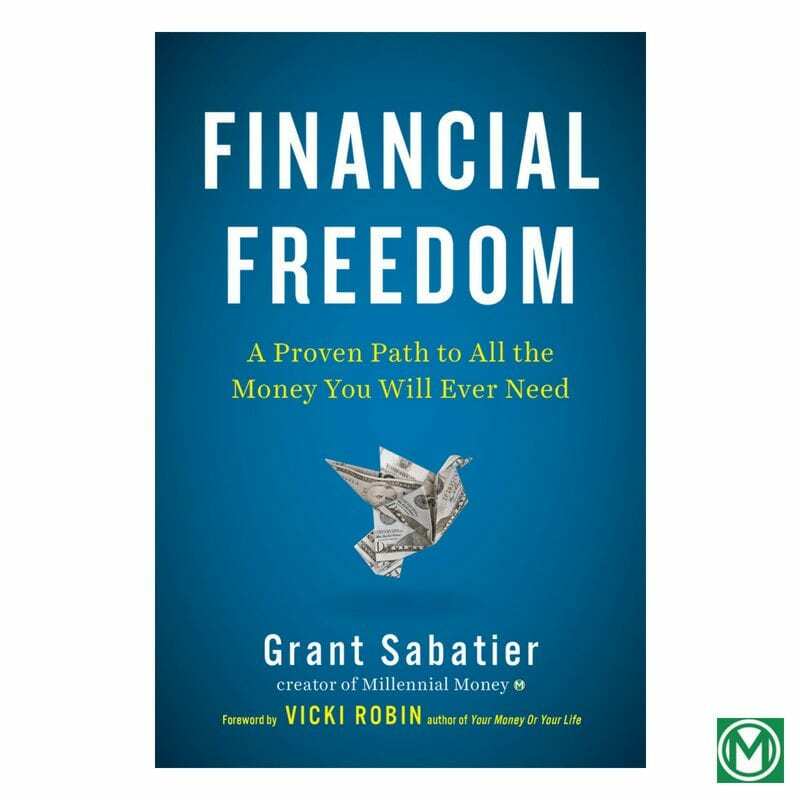 Whether you are deep in student loan debt or already have hundreds of thousands of dollars saved, this book is designed to get you to the next level of financial freedom as quickly as possible. It’s a scalable strategy designed for you to revisit it each year to check back in with your goals, your finances, and the role money is playing in your life. It can help you escape living paycheck to paycheck, but it can also help you reach financial independence, when you no longer have to work for money. In Financial Freedom, I share the exact path that I and the 12 other people featured in the book used to reach FI before 35. 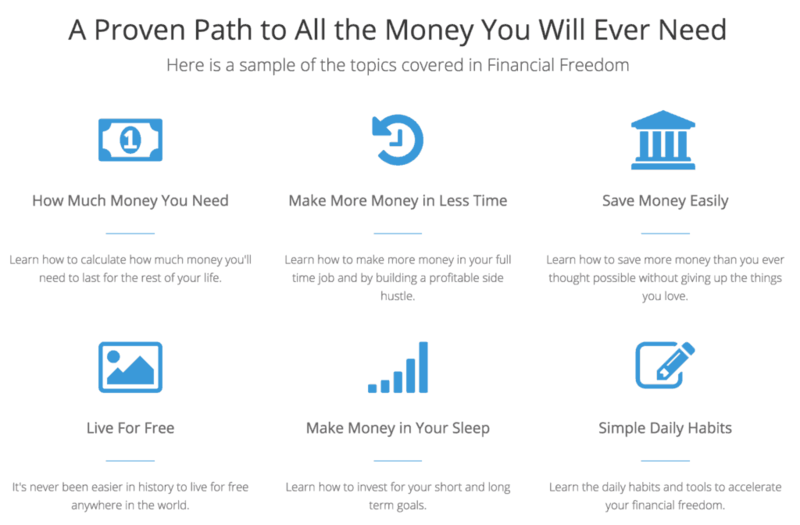 The book covers everything you need to get to financial independence, with each step designed to help you make more money in less time and accelerate your financial freedom. 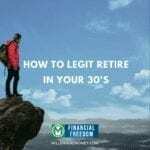 It’s about fast-tracking FIRE (financial independence retire early) and getting you to each stage of financial freedom as quickly as possible so you can make the most of your time. While I’m not a big fan of labels, and while I am certainly a part of the FIRE movement, I like to think of more as the financial freedom movement. Freedom means so many different things to different people and financially independence might feel really far away. I wanted to write a book that would help people no matter where they are on their own financial journey. The topics in the book include how to figure out how much money you actually need, how to easily save at least 25% more money without cutting the things you love, how to live for free, how to start making at least $10,000 more in the next few weeks in your full time job, how to identify and launch a profitable side hustle, how to travel the world for free, how to invest in stocks and/or real estate to reach financial independence in 10 years or less and a whole lot more. I worked really hard to write it to make it as easy to follow as possible, even for someone who has no experience with money. But it’s also designed to help people who are already on the FI path discover new ways to save money, make money, and think about money. The path in my Financial Freedom book is designed become more familiar and reveal new insights the more time you spend with it. It’s designed to be clear and easy to implement and help make it easier to understand and make the tradeoffs often required to buy back your time. Writing the Financial Freedom book was really hard. But I am so pumped to share it with the world. Over the past year I spent over 2,800 hours of my own life writing Financial Freedom with the singular goal of helping you make more money in less time, so you can feel less stress and live a life you love. At the end of the day that’s what’s important. 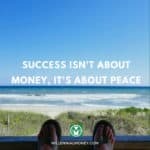 My hope is that this helps many people who are either struggling with money or stressed by money see money differently and learn how to gain freedom through it. Writing a book is no joke and nothing could have prepared me for the challenge of putting so much information together in an accessible path that anyone can follow. This isn’t some fluff book with a few key ideas and a bunch of filler, Financial Freedom is packed full of the what, why, and the how. I actually show you how to do everything. I didn’t cut any corners. I put my everything into this book and I can’t wait for you to read it. You might be thinking why would I buy a book 8 months before it comes out? Preordering Financial Freedom comes with a ton of exclusive bonuses and will help me reach more people! Publishers use preorder numbers to determine how much support to provide and where the book should be sold. The more preorders, the more support I will get from booksellers and Penguin and the more this message will spread. Also, preordering is actually nice and easy because many retailers don’t charge you until the book is released so you won’t have to pay until February, but it really helps me. If you order through Financial Freedom on Amazon they have a pre-sale guarantee so if the price drops at any point during the pre-sale you only get charged that price. Both hardcover and ebook prices can fluctuate a lot during preorder periods so if you order now you can lock in the lowest price guarantee. It’s pretty sweet and will ensure that you get the lowest price. I’m also releasing a ton of exclusive preorder bonuses that you can see below, which are a ton of extra value (I can’t even quantify it with a dollar figure). So there’s that too! Thank you for all of your support. Whether you are a long time or first time reader, I couldn’t do any of this without you! Also to all of my regular readers, thank you for your patience while I took a break from blogging to finish the book. I’m very excited to get back to a regular posting schedule on Millennial Money and have some dope posts in the works. All of the emails of support and the growth of Millennial Money and this community made all of this possible. I can’t wait for you to read Financial Freedom! Click on the logos below to preorder through your platform. Available almost anywhere books are sold. 8. 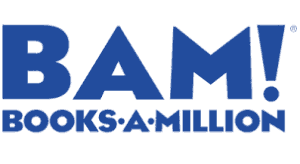 Chance to win a monthly bundle of Grant’s 5 Favorite Money Books! To claim your bonuses please forward your receipt to bonus@millennialmoney.com! Creating Financial Freedom 9 Steps to Financial Freedom Financial Freedom Podcast Episode 1 Can Minimalist Living Help Achieve Financial Freedom? Thanks Christopher! Appreciate your support. Thank you very much for the hope and opportunity to attain freedom from financial stress. Will buy it from Amazon for sure! Hi, is this just for the US market or is it open to people in the UK? Thanks.